Weibo marketing is among the top tools you’d want to learn if you want to engage in digital marketing in China. Often tagged as “Twitter of China”, Sina Weibo currently has over 361 million active users monthly. In China alone, more than 5,000 companies and 2,700 media organizations use the app to connect with their audiences. Weibo is also a microblogging site. Like Twitter, users express themselves in 140 characters and can mention or talk to other users using ‘@username’. Weibo also has hashtags and the option of follow-backs. Weibo can also be compared to Facebook. It allows users to post more enhanced media-rich format such as videos, gifs, animated emoticons, and even music. 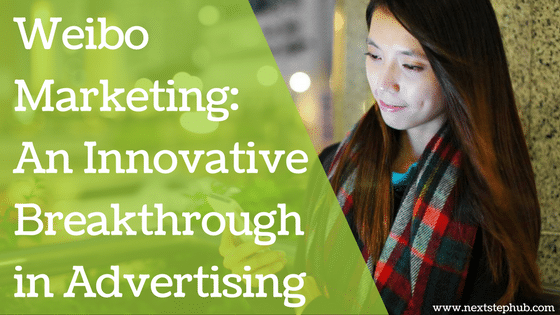 But when it comes to marketing, Weibo is unique and innovative. For starters, there are 2 types of campaigns for Weibo marketing – System and Creative. System campaigns have basic rules and formats. These rules are pre-defined by the Weibo team, and only verified accounts can launch system campaigns. There are 6 types of System Campaigns in Weibo that you can choose from. Lucky Roulette Campaign – A lottery format that allows users to win a variety of prizes. Flash Sales Campaign – This is more beneficial for e-commerce and online to offline businesses (O2O). Here users can win gifts or special discounts for the promoted products for a limited time. Repost Campaign – This campaign has a reputation of achieving the best marketing results. A repost campaign requires the user to repost a certain post in Weibo. Sometimes, users are asked to follow a certain brand’s account or mention 2 to 3 friends on their post. Winners are randomly picked after the campaign period. Content Collection Campaign – This creates an engagement from other Weibo users. This campaign encourages users to provide original content such as reviews, pictures, or videos related to the brand advertised. The organizers will pick a winner based on the quality of the content. Free Trial Campaign – This campaign lets brands distribute product samples to their audience. To get the samples, users must give reasons why they should be picked. This also helps brands collect necessary feedback before the official release of their products. Pre-ordering Campaign – This applies to releases of high-value products like computers, communications, and consumer electronic products. Only those who have preordered are qualified to purchase. On the other hand, Creative Campaigns are more flexible. Brands can create and customize their campaigns according to their needs. They can decide for prizes, number of winners, and rules. Creative campaigns can also be used by verified and non-verified accounts. Since Creative Campaigns have no fixed rules, this is usually presented in the form of a post. Others are creating a challenging quiz to make it more fun and creative. The effective strategy here is to run campaigns that are related to trending topics, such as holidays and big events. The variety of campaigns on Weibo gives brands more practical and effective options to reach their target market. Take for example the Repost or Content Collection campaign. Users will repost your company’s news or any updates by default if they join this type of campaign. This can widen your brand’s exposure and generate leads. With this, campaign information will spread rapidly to many more Weibo users. They will notice your campaign continuously, giving you more participants. Weibo’s Creative Campaigns attract more users to take part in your marketing campaign. Creative contents can make your brand more appealing that it will stand out among others. Let’s take Fendi as an example. In 2013, the giant brand launched an interactive campaign on Weibo called “Fendi Play with Colors”. Fendi invited the Weibo users to vote for their favorite color in Fendi’s Weibo page. The result? The campaign increased the brand’s activity by 44 percent. They also accumulated 4,547 reposts. Interacting with social influencers help add a personal touch to your company. They can also allow you to borrow their halo effect so you can use it for your personal brand. In 2011, New Zealand Tourism signed up Chinese actress Yao Chen as their brand ambassador in mainland China. She had more than 40 million Weibo followers. While on tour in New Zealand, Yao Chen posted regularly on her social network account. New Zealand’s Weibo page had images of the actress, video messages, and even airfare packages. Yao Chen’s social media activity raised the profile of New Zealand among Chinese people. In addition, New Zealand’s Weibo page received referrals of almost 20,000. Here are 6 tips on how you can maximize the use of Weibo in your marketing strategies. 1. Know your goals and target market. Determine the demographics of your target market such as their age, gender, and interests. You can use Weibo’s search bar for this. It will give you relevant results for people, interests, and posts. 2. Create awesome content that encourages engagement. People respond better to visual content, so create images and other formats that can catch their attention. Weibo is the ideal place to post photos and video, so take advantage of it. Showcase your brand’s latest collection, create enticing posters or share videos about your products. 3. Use guest bloggers and social media influencers. Reach out to these people and ask them to create blogs and articles for you. 4. Improve your presence in Weibo. Respond to comments, post regular content and be active and visible on the site. 5. Know the trends. Like other platforms, Weibo is changing. This year, it launched Weibo Story wherein users can post a 15-second video of your day-to-day life. This is a great avenue for businesses to showcase their products live. 6. Keep SEO in mind. In China, there is only 1 search engine that people can use, which is Baidu. Baidu works differently compared to Google. To rank in Baidu, there are factors that you need to consider. Relevance – If you want your Weibo page to show up when people search for it in Baidu, your page name should match your brand name. Verified accounts – Make sure that your Weibo accounts got V badges because verified accounts rank better in Baidu. The Frequency of updates – The more you post, the more likely Baidu will rank your content. Followers – Baidu will look into the quality and quantity of followers of your account especially for non-branded items. 7. Use hashtags wisely. Like Twitter, hot topics can be identified through hashtags. But instead of one #, Weibo has two. For example, #NextStepHub#. Try to include the popular hashtags on your posts to get new views and followers. 8. Analyze your data. Weibo gives a detailed account analysis which includes the number of followers, views, and posts shared. This will help you review your marketing’s performance and improve your strategy. Weibo is the most efficient channel to influence the Chinese Market. The advertising platform can strengthen your brand and help you achieve consumer growth. With the right campaign, Weibo marketing will surely give your company a sharp competitive edge.